NEW YORK (CNNMoney) - The middle class is struggling to survive and shrinking before our eyes, the Pew Research Center reported on Wednesday. 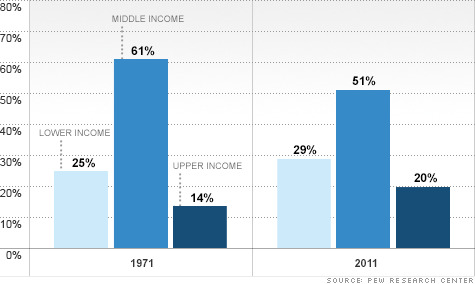 "America's middle class has endured its worst decade in modern history," the Pew Research Center said in its report. "It has shrunk in size, fallen backward in income and wealth, and shed some - but by no means all - of its characteristic faith in the future." Of the 2,500 people Pew surveyed, 85% of those who identify themselves as middle class say it is more difficult now than it was a decade ago to maintain their standard of living. The report also found that the middle class is a much smaller part of the population than it used to be, while the poor and rich extremes of society are expanding. The biggest issue facing the middle class is that their wealth is deteriorating, said economist Richard Fry, who co-authored the report. The housing crisis eroded much of the middle class' net worth, creating a "lost decade" in terms of economic well-being for this group. "For middle-income households, a lot of wealth was in their home, so the housing bust really impacted their nest eggs," he said. "Middle-income families are the only ones whose nest eggs have plummeted."